The flowers that we call Lilies are Lilium species and cultivars. 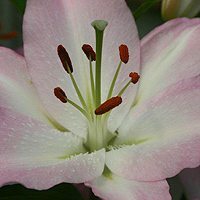 With over 100 species of Lilium bulbs for sale, these flowering bulbs provide a wide range of possibilities for the garden. All varieties prefer a well drained soil with lots of well rotted compost, some protection from hot afternoon sun, and you have a good spot for liliums. Asiatic Liliums are very popular although not scented. Lilium Longifolium are used extensively in the cut flower industry. Liliums come in a range of forms Asiatic Hybridss, Oriental Liliums, Perfumed Trumpet Liliums, Lilium Longifolium x Asiatic (LA cross), OrientalLilium x Trumpet, Asiatic species and Species Lilium. Oriental types have large flowers and are fragrant. Martagon Lilies with their nodding flowers are most attractive. A huge range of flower colors from white through to deep red. Many liliums are fragrant and flowers can be spotted, or have a brush stroke appearance. Liliums mostly grow from bulbs and are deciduous. Species lilies are as they were in the wild not hybridized. Species Lilies are native to a range of areas including Europe, Asia, India and America. Species lilies are the starting point for all of the hybrids. Some Species lilies are great hardy garden plants, some are difficult or ‘challenging’ to grow, but all are rewarding. Asiatic Hybrids have a huge color range from white through to deep red, are easy to grow and are the earliest to flower. The flowers of Asiatic Hybrid Lilies can be pendant, upward facing or downward facing and are in general Asiatic Hybrids are not fragrant. The most popular asiatic lilies seem to be the yellow and orange varieties, new varieties have spots, speckles and brushmarks. Martagon Hybrid Lilies or martagon hansonii are sometimes referred to as ‘Turks Caps’. Downward facing flowers with lots of flowers growing on tall stems. Martagon Liliies prefer a shaded position and like to be well mulched, leave undisturbed for best results. Candidum Hybrids flower in early summer, generally white fragrant flowers also referred to as ‘madonna lilies’. Plant these only10cm deep. Really a beatiful lily. Long trumpet shaped flowers, used a lot in floristry, Longiflorum are a little fussy to grow. White is the common form however yellow forms are now available. Growing up to 2.5m Trumpet Lilies are giants, a wide range of colors from white through to purple. New shorter growing types of Trumpet Lilies are available, but why not look for the tall ones. Oriental Hybrids have great color and great fragrance, pure white through to deep purple. Oriental Hybrids are smaller that asiatics oriental hybrid lilies. Oriental Hybrids prefer semi shade, a humus rich well drained soil and mulch to keep the roots cool. Orienpets are a cross between Oriental Lilies and Trumpet Lilies. Other crosses between divisions are plentiful. Orienpets are fairly tough and will cope with colder conditions.